Spring 1912 Butler Bros. Catalog. 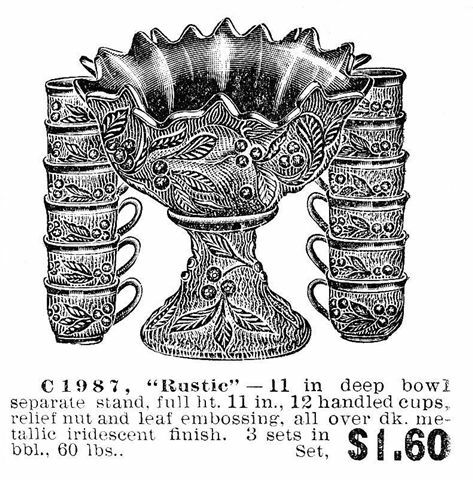 metal cup hooks. Bowl is 11 in. across the opening. 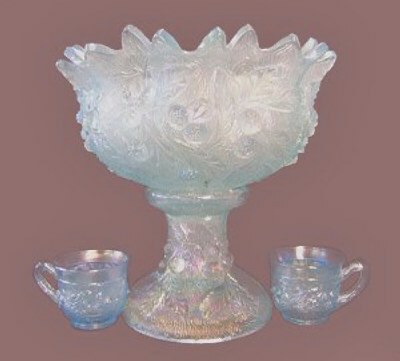 Right - ACORN BURRS Punch Set in Ice Blue. 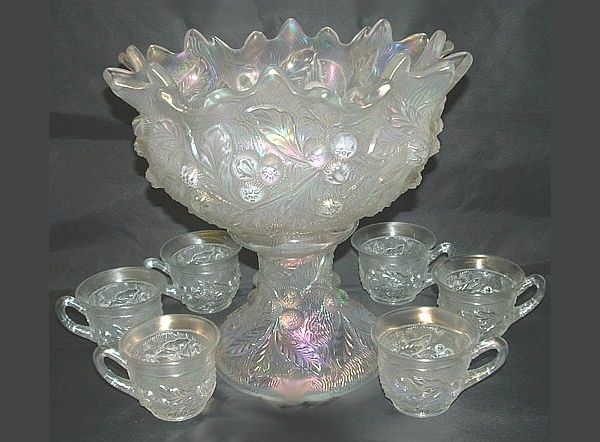 ACORN BURRS Punch Set in White-$8500. ACORN BURRS set in Green - $1800. L.L. Conv. '07. 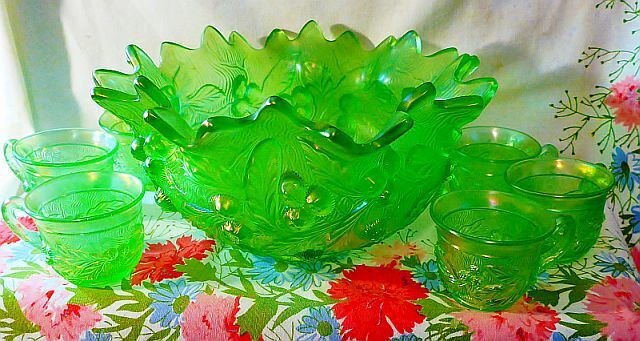 Ice Green Acorn and Burrs Punch Set - Courtesy of Richard Fenton. ACORN BURRS: Demand outweighs the supply for this Northwood set, so top dollar is always paid for any set which appears for sale. 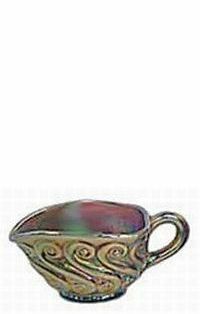 Marigold, green amethyst, white, ice blue, ice green, aqua opal, with cobalt blue cups known to exist. 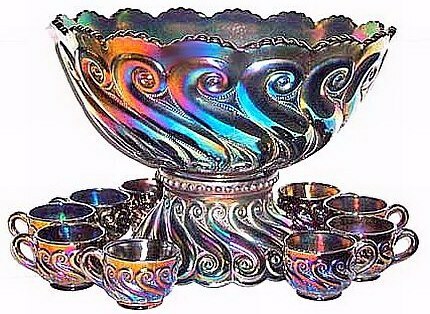 Strength of color and the iridescence is tops on all the sets we have seen. Imperial WHIRLING STAR 14 pc. Punch Set. WHIRLING STAR: To say that these sets are rare is an understatement of huge proportions. 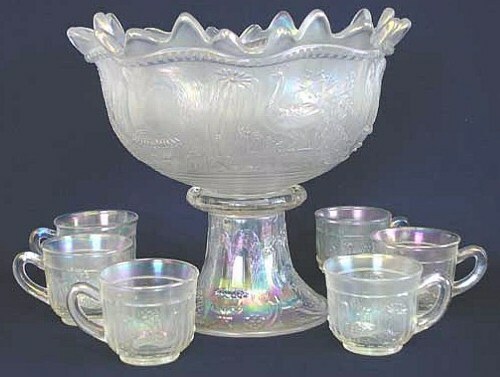 When writing earlier about the pattern, also produced in smaller version by U.S. Glass, the only photo of this set from Imperial that we could muster, was one from a factory catalog page. It has taken quite some time to acquire this wonderful photo of the actual element. Standing an eloquent 13 ½” high, it assuredly commands attention, although few such sets are utilized in this world today. 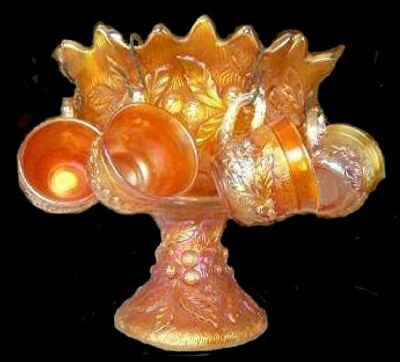 Marigold is the only known color. 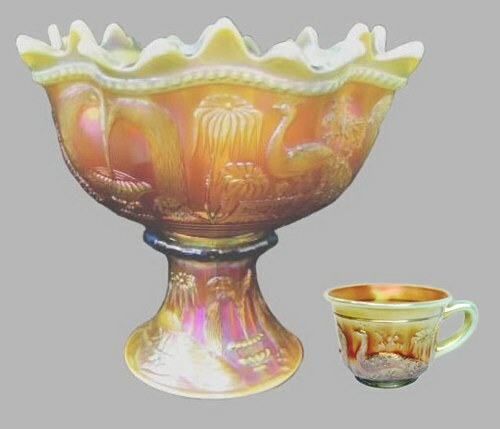 During the `60s-`70s, new sets were produced with the IG trademark placed into the pattern, slightly up the side of the bowl-not on the collar base. somebody filed all the points off the bowl edge! 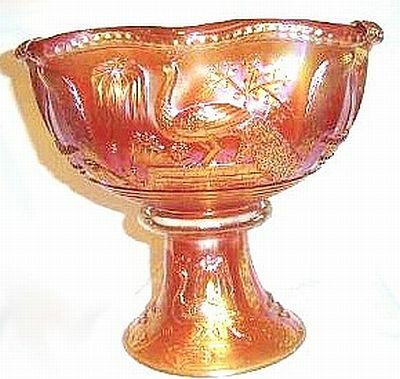 Punch Bowl & Base.-1 of 4 known. Northwood PEACOCK @ the FOUNTAIN in Mgld. PEACOCK @ the FOUNTAIN Set in White. Lime Green Bowl, IG Base. PEACOCK @ FTN. PEACOCK @ the FOUNTAIN: Surely there are not many of these punch sets having had all the points filed off, but beware! 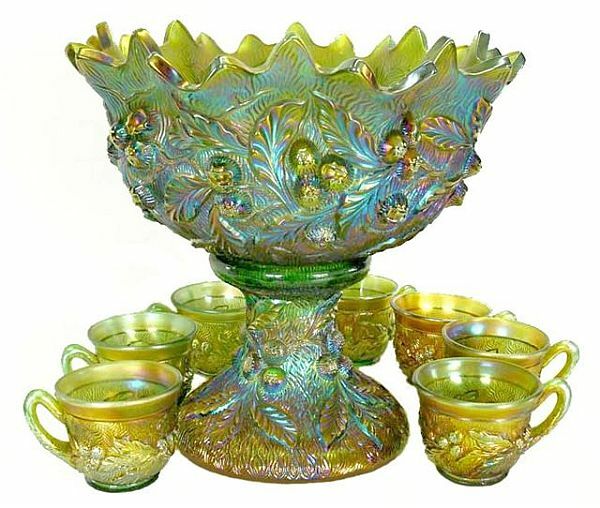 Marigold, amethyst, green, cobalt blue, white, ice blue, ice green, aqua opalescent, Renninger blue punch bowl only. 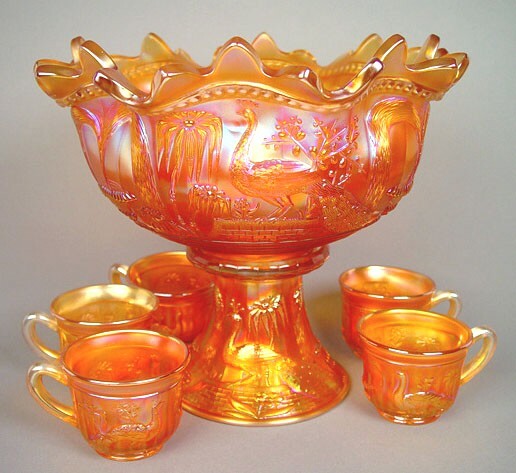 Peacocks in any form are a favorite with collectors, this Northwood set being no exception. 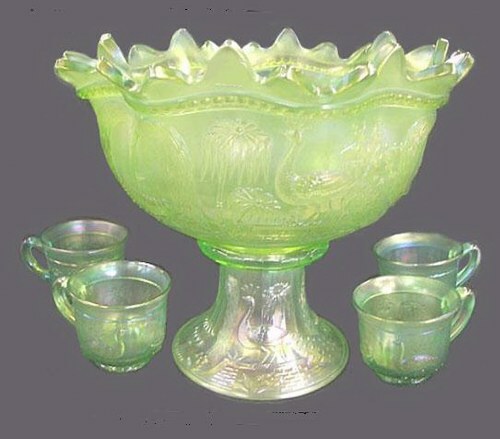 We watched with interest while a young couple at an auction bid more than $3,000 for an ice green 8 pc. set many years ago during the early `80s. If they still own that set, it would no doubt sell for more today. Left - Dugan S-REPEAT Punch Set in Purple. One of these sold for $5000. at the 5-28-05 Wroda Memorial Day Weekend Auction. S REPEAT: This Dugan rarity always creates pandemonium when it appears at auction! 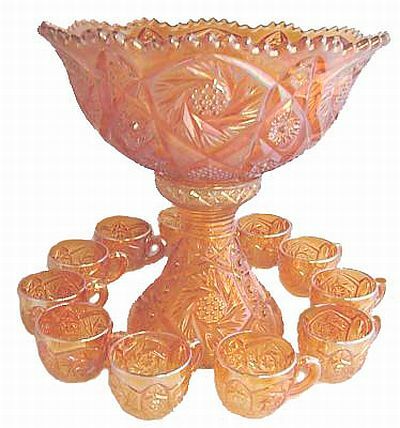 It is eagerly sought by many collectors. Known only in purple carnival. I am a stranger in the earth; do not hide Your commandments from me. My soul breaks with longing for Your judgments at all times. You rebuke the proud-the cursed, who stray from Your commandments. Remove from me reproach and contempt, for I have kept Your testimonies. Your testimonies also are my delight and my counselors.